Reviewed: The HX90V - A master of miniaturisation, with a 30x optical zoom lens, built in pop-up EVF, GPS, Wi-Fi, and tilting screen. 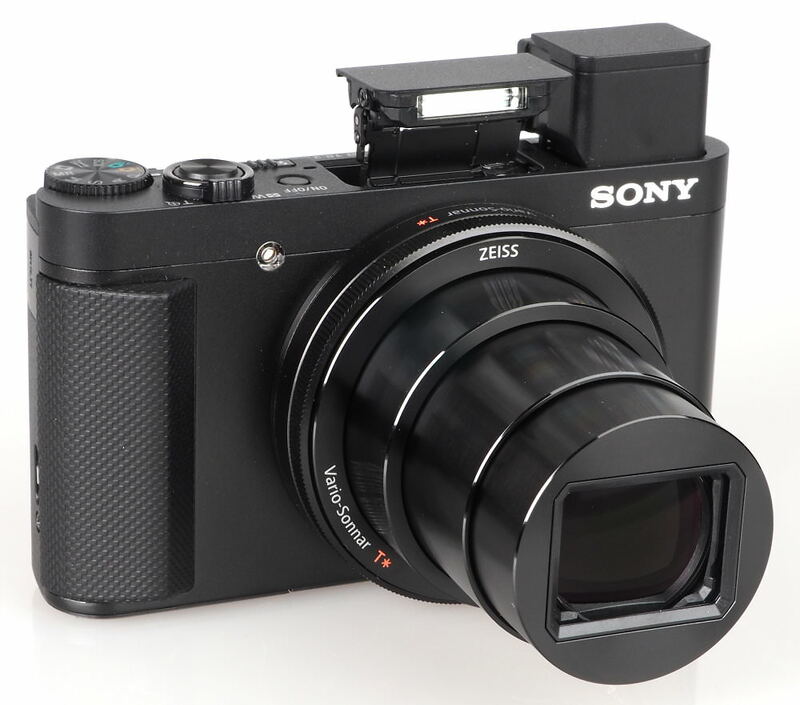 The new Sony Cyber-Shot HX90 / HX90V, available in black, the compact camera features a 30x optical zoom lens, 18 megapixel BSI CMOS sensor, built-in pop-up OLED Tru-Finder EVF, full-HD video recording, and a tilting "selfie" screen. 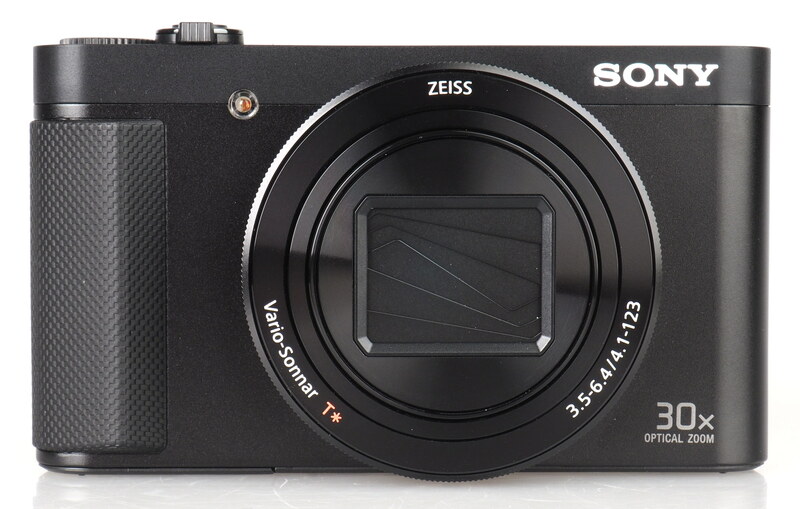 The camera is one of the smallest digital cameras available with a 30x optical zoom lens, and features a newly developed Zeiss Vario-Sonnar T* 30x optical zoom lens. 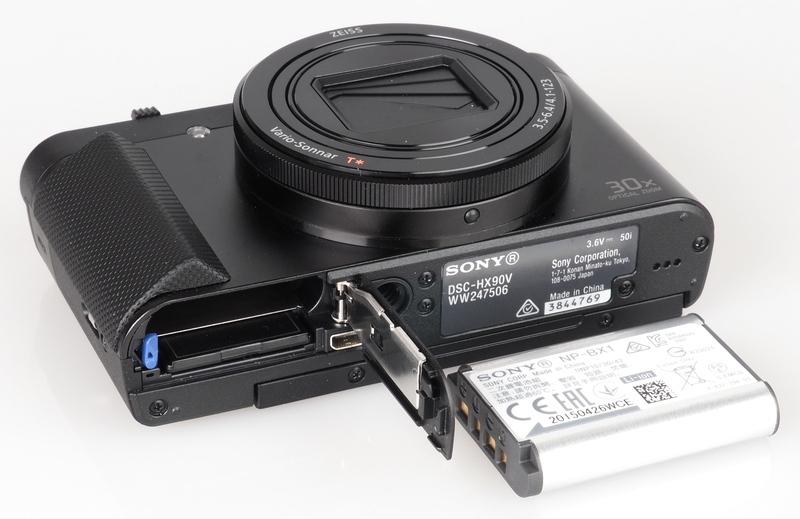 The Sony Cyber-shot HX90/HX90V updates the HX60. 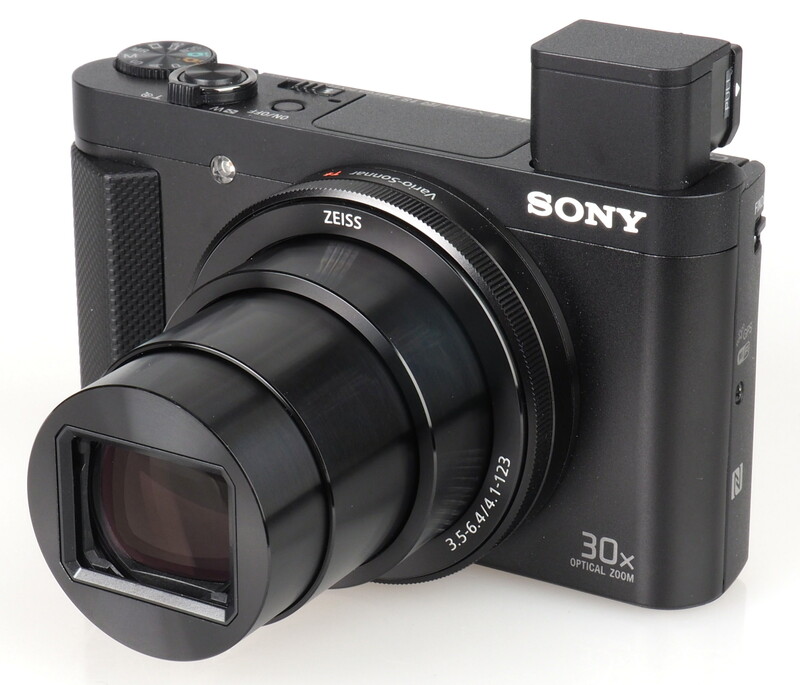 Not happy with offering a 30x optical zoom lens in the Sony Cyber-shot HX60, Sony has gone one better with the HX90, by offering the World's smallest compact camera with a 30x optical zoom lens. The 30x optical zoom lens is the equivalent of 24-720mm in 35mm terms, and features 5-axis Optical SteadyShot (Optical Image Stabilisation to you and me). Along with the World's smallest 30x optical zoom lens camera, the HX90 also offers built in Wi-Fi and NFC, and with the HX90V, built in GPS. Wi-Fi lets you transfer photos to a compatible smartphone or tablet, as well as control the camera remotely. Sony PlayMemories Applications can be added to the camera, expanding what the camera is capable of doing. Hidden away is a small pop-up electronic viewfinder, that will also act as an on / off switch when popping up and down to switch off. The built in electronic viewfinder (EVF) may seem like an unneccessary luxury, however, when using most digital cameras outdoors in bright sunlight, the EVF becomes an excellent option, and stops you from struggling to see what you are shooting. The 3inch screen on the back can be tilted to face you so that you can take "selfie" shots. The camera uses a backlit 18 megapixel CMOS sensor, and shoots at up to 10fps, as well as recording fullHD video with stereo sound. There are a range of scene modes to choose from as well as full manual controls. Other modes include Intelligent Sweep Panorama and a large number of artistic effects which includes toy camera, partial colour and HDR painting. 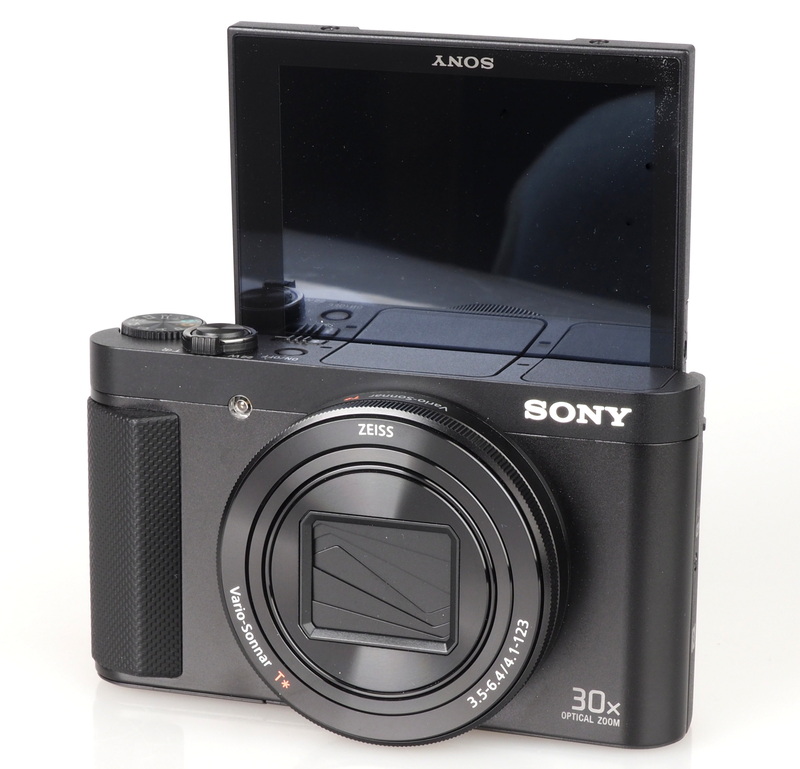 The Sony Cyber-shot HX90 is impressively compact considering the features and optical zoom built into the camera. At first glance it's easy to forget that there is a built in electronic viewfinder and pop-up flash, and when these pop out you are left impressed by the ability of Sony to fit so much into such a relatively compact camera. To further demonstrate the size of the camera, we've shown the previous model, the HX60, below, and this does not feature a built in electronic viewfinder. The camera feels well built with a metal body, along with a good sized handgrip making it easier to hold the camera steady. There is a small mode dial on the top left, and a zoom rocker surrounds the shutter release button. 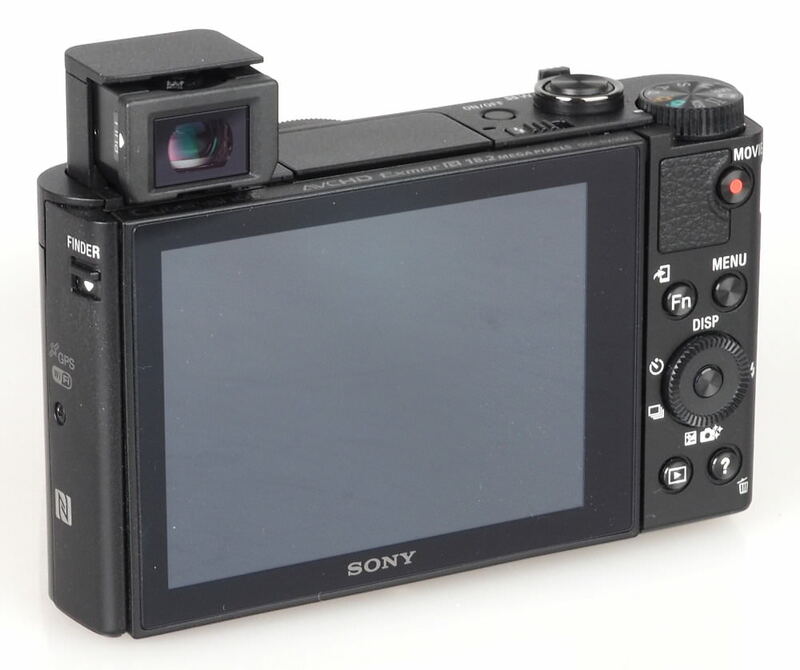 Sony Cyber-shot HX60 next to the Sony Cyber-shot HX90. The electronic viewfinder (EVF) is clear, but quite small. The screen is clear with a good resolution, although can be difficult to see outdoors in bright sunlight and turning up the brightness can help. The menu system is clear and well laid out, making it easy to navigate. The Fn button on the back of the camera gives you quick access to a number of settings on the screen, making it easy to change settings without having to go into the main menu system. Wi-Fi features - You can select images on the camera to send to the smartphone. You can also use NFC to setup a remote connection so that you can control the camera from your smartphone, and adjust zoom, set the self-timer and take photos. With the camera set to video mode on the dial you can also start and stop video recording. Battery life - Battery life is rated at 390 shots according to Sony / CIPA test results, which is very good for a compact camera, although this will be reduced with extensive use of GPS and Wi-Fi. Shutter response and focus speeds are very good, and the camera can shoot at a high speed of 9-10fps for up to 10 shots. Shooting with flash does reduce the cameras shot to shot speed noticeably. Sample Photos - Portrait photos taken with flash occassionally show red-eye, and the use of a higher ISO setting has resulted in some noise visible in the image. Exposure is good with the camera producing images with bright saturated colours. Dynamic range is good, and the camera will automatically improve shadow and highlight detail using the DRO (Dynamic Range Optimisation) setting. For enhanced dynamic range, there is built in HDR shooting which combines a number of different shots. Lens Performance - Detail is quite good when shooting at the wide-angle end of the lens, although there is some corner softness, and detail does become softer at the telephoto end of the lens. The camera does a good job of correcting lens distortion with minimal amounts visible. Purple fringing is well controlled, but most noticeable when shooting in high contrast situations such as trees against the bright sky, and becomes more noticeable towards the corners of the frame. Macro performance is good, with the camera automatically focusing on close subjects without the need to activate a specific macro focus mode. ISO Noise Performance - For the lowest noise and best detail possible we would recommend using ISO80 to ISO400, as images have low levels of noise and good levels of detail. For lower light situations ISO800 to ISO1600 still provides good results, although noise increases and detail is reduced. At ISO3200 noise levels become strong and we would recommend avoiding this setting if possible, although results may still be useful if resized and used on the web. ISO6400 and above is best avoided as noise is extremely high, and detail is very low. ISO80 to ISO3200 is available in normal shooting modes, with ISO6400-12800 available when selecting the multi-frame noise reduction mode that combines a number of shots. White Balance Performance - Auto White Balance (AWB) performs well with a slightly warm result under tungsten lighting, with the tungsten preset giving a very similar result. AWB performs very well under fluorescent lights, with the fluorescent preset giving a magenta colour cast. Digital Filters - There are a large number of creative effects available, a number of these have additional options and settings to alter the effect further, and examples are shown above. Panorama mode - The camera features an automatic panoramic mode, where you simply press the shutter release button and pan the camera from one side to the other. Results are good, and well stitched together, although with a fairly low resolution image produced. Video - The camera records full HD video with stereo sound and optical zoom. Quality is good, and optical image stabilisation does an excellent job of keeping the image stable even when using the full optical zoom. The Sony Cyber-shot HX90V is one of the most compact 30x optical zoom lens cameras available and even packs in an electronic viewfinder making it great for use on bright sunny days. The HX90V is priced at £349 making it more expensive than the competition, however it is the most compact 30x optical zoom lens camera available with a built in EVF. The camera performs well, with quick performance, bright colourful images and numerous shooting options. Built in Wi-Fi, and GPS in the HX90V, means you can quickly transfer images and control the camera from your smartphone. 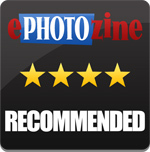 Whilst the camera may be expensive, we think it is worth the investment. 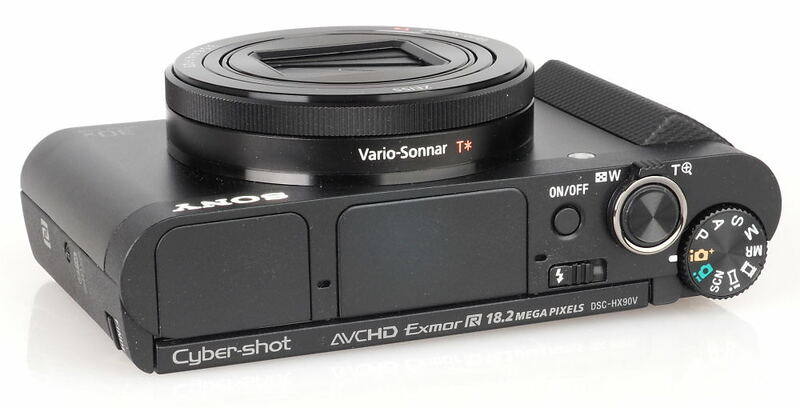 The Sony Cyber-shot HX90V is an ultra compact travel zoom packed with features including a great electronic viewfinder. "Noise visible in images taken at ISO80"
It's enough to realize how rough 18 Mp can be...What happen to U sony? This camera would probably benefit from having the pixel count reduced to 12 million, as Panasonic did with the TZ70, I think.